The events of this week find me wanting to temporarily curtail my sojourn into woodwinds in world music and present something both fun, and from Kenya. So here we are, spending a little time with an East African bar band; a bar band putting their own particular spin on a classic Perez Prado tune, in fact. While the Cuban influence was felt from West Africa, across Central Africa, and into East Africa in the 78rpm era – boleros, rhumbas, and cha-chas galore, especially in Congo – this is one of the few 78s in my personal collection where Africans actually cover a Cuban pop song. Where were the Kiko-Kids from exactly? According to the scant information available, they were from Kenya, though there’s at least one source that indicates they were itinerant. The independent Tom Tom label, who released this week’s post, was based in Kampala, Uganda, and recorded music from across East Africa. The sleeve for this record, however, indicates that it was recorded in the Equator Club in Nairobi. (Boy, would I love to see some photos from that place in full swing.) Making things more complicated, on one of John Storm Roberts’ long out-of-print CD releases on his phenomenal Original Music label (Dada Kidawa Sister Kidawa) they are credited as Kiko Kids Jazz, from Tanzania. So, it’s quite possible that they should be best referenced as an “East African” band, but let’s, just for today, say they’re from Kenya. 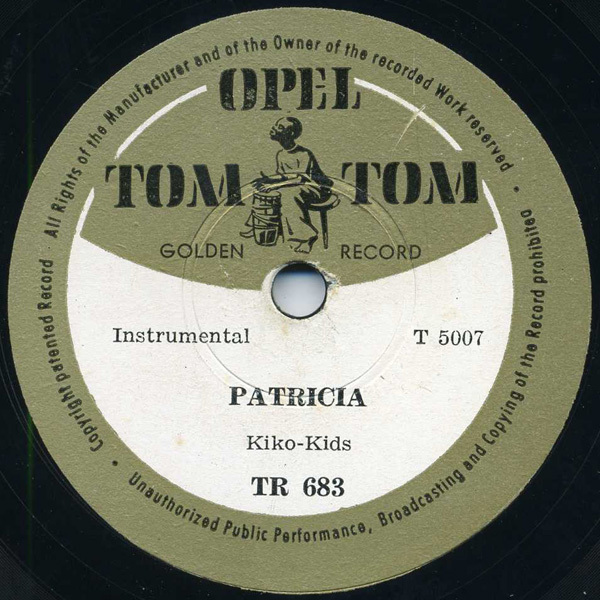 As mentioned, Tom Tom was based in Kampala and their records were pressed there too, by the Opel Gramophone Record Factory, Ltd. “Opel” stood for Dr. Georg von Opel (1912-1971), the German industrialist. Opel was the grandson of the founder of the Opel automobile company, a member of the International Olympic Committee, and Vice-President of something called the International Leisure Association (I must remember to emulate that career track). According to reader Peter Steinringer, the Opel Gramophone company was founded in 1956 and closed in 1960, due to a Ugandan boycott of businesses owned by foreigners. Also according to Steinringer (in the comments), Opel produced 50,000 discs a month and had nearly 200 employees. The independent 78 rpm record label scene in East Africa was varied and broad, with dozens of small and large labels securing their places in the market. Most are also quite scarce, today. Interesting–I’ve always loved the “Patricia” tune, and this is a great version. Oddly, this actually sounds kind of like early Jamaican ska, though it was recorded apparently a few years before ska developed. I love the arrangement. Thanks for helping preserve this music. Thanks, Joe – I appreciate it. Yes, it’s definitely pre-ska, but not by much I don’t think, since ska seemed to develop as early as the late 1950s. Zim: absolutely true, of course. Even the Mzuri label, which released tons of Tanzanian/Zanzibar 7″ 45s from the 60s-70s, was based in Mombasa. But that is for 45s, where there were scads of independent labels (most if not all of John Storm Roberts’ releases were from 45s). For shellac 78s, one needed certain equipment – there was certainly a 78 pressing plant in Nairobi, and apparently one in Kampala as well (they used exactly the same font typeface). At the same time, however, the major labels were recording all over East Africa, and still pressing records in England (HMV, Columbia, etc) or sometimes even India. A 78 pressing plant in Zimbabwe opened up sometime in the late-50s/early-60s I’m guessing. That plant used exceptionally high quality material – those 78s are absolutely noise-free. thanks for the info on the shellac pressing – was there a shellac plant in Dar-Es Salaam? toward the bottom of p. 511, it indicates that it was a mixed group with its genesis in the Entertainment unit of the King’s African Rifles based in Kampala -that there were “coastal” soldiers and ugandan recruits involved as well. Of course the group might have evolved from that info to the time of the recording. I am not sure about a shellac plant in Dar-Es-Salaam. There was recording done there as early as the 1930s, by Odeon. But those records were pressed in Germany. Columbia and HMV records recorded in East Africa were pressed in England (and sometimes India). Jambo Records, the first East African independent, was pressed in Nairobi, as were other Kenyan independent labels. Trek/Gallotone was pressed in the UK until the Zimbabwe/Rhodesia plant opened. I can’t say that there wasn’t a shellac plant there for sure, but I see no evidence yet of one – there are a few more sources I can check to make sure. As for 45s – a totally different story. Thanks for the World Guide excerpt. I consult the World Guide with almost everything, as you never know what you might find, so I had seen that. Note that the excerpt appears in the section on Kenya. My hunch is that the group had evolved by the time of this release, as the King’s African Rifles/Rhino Band split occurred in 1948 as the information suggests. This record is from the mid-1950s. My other clue of the band evolving being that they may have been regularly performing at the Equator Club in Nairobi by the time this record was released. cool, thanks for the the further info, especially the citation from the journal of the colonial service which I would NEVER have though to look at. Do you know if the equator club was affiliated with the later equator sounds label? So when are you going to write an multi-volume encyclopedia of known 78s by continent/country? I’m flattered you would even suggest that, David. The only book that comes vaguely close to that description is Paul Vernon’s “Ethnic and Vernacular Music, 1898-1960.” That book goes country by country and simply lists labels that were actively recording, and the number series’ that correspond. It’s quite a feat, considering it was basically compiled pre-Internet. A massive new edition of that book could be compiled and would be fantastic. However…there would be very little money in return for such a gargantuan effort. Time to apply for a grant. came across this song today searching for jazz music for kids and was so pleasantly surprised because it reminded me of an old cassette tape i had in college which was made, i think, in the 60’s, called “kampala sound.” upon hearing kiko kids my guess was that it was from this same region/era in uganda. i’ve been searching for more recordings by kiko kids now, hoping to dl some for my kids and new baby. if anyone finds “the Kampala sound” too let me know….it is amazing music! Prado recorded “Patricia” in 1958, so this recording has to be from some time after that. Dr. Georg von Opel was not the Founder of the Opel Company. That was his Grandpa, Mr. Adam Opel. The Opel Gramophone Record and Battery Company, Ltd was founded in 1956 and had to be closed in the beginning of 1960 because of the boykott the people of Uganda startet against white and indian dealers and factory owners. Thanks very much for the information, Peter. I’ve amended the post, crediting you for this helpful information. I am currently digitising 10 Tom Tom discs at the British Library Sound Archive and found this article during my pre-transfer research, thank you. For the record, I’m playing these discs with a 2.8ET stylus, WESTREX curve, 78 RPM.